BELLEVILLE • The 35-foot-long beam isn’t just part of a memorial, or a remnant from a former towering structure. It’s evidence, according to officials in New York. But that same 7,000 pound beam was more than crime scene evidence to speaker after speaker at that beam’s dedication into Belleville’s Sept. 11 Memorial Walkway of Southern Illinois. It’s evidence of “outstanding community support,” said Belleville Mayor Mark Eckert. It’s evidence that “my faith is well-placed in the American people,” said Belleville Police Chief William Clay, even with the sharp increase in gun-related deaths of police officers. “I have faith in the American people for a better tomorrow,” he said. It’s evidence that “on Sept. 11, our enemies chose to divide us, but we chose to stand together,” said Col. Laura L. Lenderman, installation commander of the 375th Air Mobility Wing at Scott Air Force Base. All that evidence of a strong community is built into the memorial unveiled Sunday afternoon in front of hundreds at the Belleville Fire Engine House 4, at Illinois 159 and Illinois 15. The beam itself points straight to New York, and is connected to two towers spaced to show where Flight 11 struck the North Tower and Flight 175 struck the South Tower. The memorial’s plaza is a pentagon, and the sidewalk from the parking lot to the memorial is 343 feet long. Two Belleville firefighters used pike poles to bring down the drape and reveal the beam to a quiet crowd. Jennifer Meyer, of Belleville, watched dignitaries tour the memorial first. She said she would probably return another day to take the walk herself. “It’s just awesome to see in Belleville such a profound piece of history,” she said. Meyer remembered working at the St. Clair County Health Department that day, and being concerned for friends who were traveling. “It was a day you reached out,” she said, to check on your family and friends. The walk, pentagon shape, timeline, towers and beam are all just the first of three phases of the memorial, said Sharon Strausbaugh of the September 11 Memorial Walkway Committee at the dedication. The next phases are tributes to Flight 93, which crashed in Pennsylvania, and a gathering area that will include sponsor bricks. The number 343 was often repeated throughout the ceremony, as it was the number of firefighters killed 15 years ago. 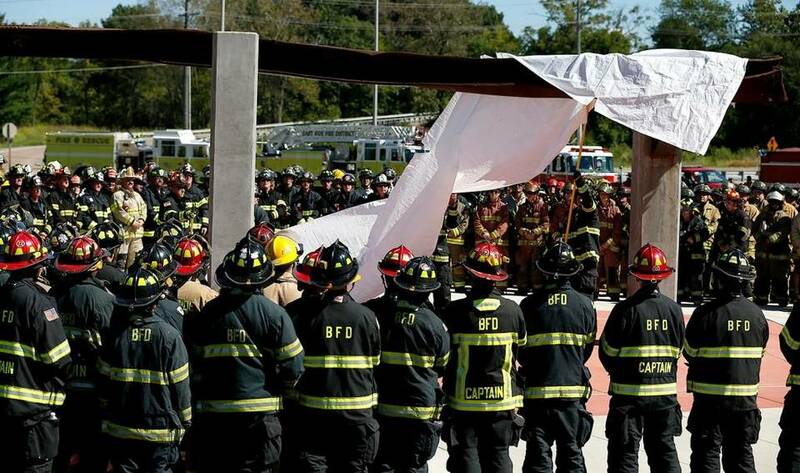 The ceremony started as 343 firefighters walked silently, save for the muted clanking of their turnout gear, from the Belle Clair Fairgrounds to the firehouse. Each man and woman from metro-east fire departments represented a firefighter killed on Sept. 11. Belleville Fire Chief Tom Pour made two promises in his remarks to the crowd of more than 400. The committee will continue to work toward a complete memorial, one that also honors the victims of Flight 93; and he will have an annual ceremony for any firefighter that dies in the line of duty in Southern Illinois. “The key things we still have to get done are for Flight 93,” Pour said after the ceremony. The key person in the memorial’s presence at all in Belleville agreed that Flight 93 must be included. Linda Weisenstein was widely credited on Sunday with having both the idea and the determination to make the memorial happen in Belleville. She had brought an article to the attention of the Eckert administration that the Port Authority was providing artifacts of Ground Zero.